Pittsburgh, PA – November 29, 2018 – PWCampbell has promoted Ben Mahtani to Vice President and Chief Information Officer. Ben joined PWCampbell in 2013 as the Information Technology Director. In this position he was instrumental in developing BrandVisionHD, the company’s digital signage products and services. Under Mahtani’s direction, PWCampbell has installed more than 1,300 digital signage screens across the country. 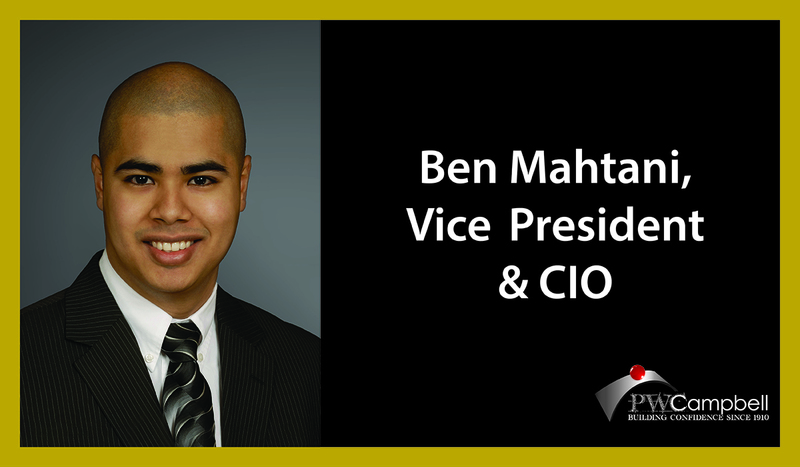 In addition, Ben led a company-wide corporate ERP software conversion which enabled the company to increase efficiencies, minimize risk, and positively impact the bottom line – contributing to the company’s overall success. Ben has over 10 years of experience in information systems management and technology integration, of which 5 years are with PWCampbell. In his tenure with PWCampbell, Ben has also implemented the latest in construction software and security solutions to manage our business, and has grown overall revenue for our company. He holds a Bachelor’s Degree in Business Management from Grove City College and a Master’s Degree in Accounting and Financial Management from Keller Graduate School of Management. “Over the last five years, the technology advancements at PWCampbell have been outstanding. We are able to run our business today with more data and financial analysis. Ben is the chief contributor to this“, stated James G. Caliendo, President & COO, PWCampbell. “Mr. Mahtani is the main driver of all the technology services to our clients. It’s pretty amazing to see a design/build firm be able to offer banks and credit unions the latest in digital technology,” added Caliendo.